Opening Statement: Start with the defensive side of the ball. I thought we got off to a fast start in the ball game. No penalties. Forced a couple turnovers and held Pittsburgh to 23% on third down, which was a plus. What we have to work on – we have to continue to build up the starters this week heading into next week, develop the second and third group and schematically set the edge of the defense better. Offensively, what we did well – we had a lot of opportunities in the game to evaluate the players. 72 plays. I thought we flashed some physicality and finish. The emphasis was moving the pocket and screens in the ball game for us. I thought we got a good look at that. It’ll help us down the road. What we need to work on – we need to sharpen up with our assignments. We weren’t sharp there. We need to eliminate the number of sacks that we had in the ball game. It wasn’t all the offensive line, but we did have some push. We had some wide receiver errors. The quarterbacks held onto the ball at times and actually running out of bounds on one occasion four yards short of the line of scrimmage, which was a sack. Unforced errors in the green zone hurt us. We had a penalty. We had a bad snap. Should have thrown the ball away on one occasion and it really dates back to last year in 2016. Drives without a negative play, we scored touchdowns on 74% of those drives and drives in the green zone with a negative play, we didn’t score a single touchdown. On special teams, the coverage teams got off to a good start. We did have a pre-snap penalty. We have to eliminate that from our play. The return game needs some work. We muffed one return that led to a touchdown and we had another ball on the ground on a kick return. Our post-snap, we had a block in the back there, a penalty. We need to show some awareness. Our vice needs to tighten up and our kickoff return, we need to detail the depth of those drops. The positive thing is we have one heck of a battle going on at the kicker spot. With that, we’ll open it up. Q: Did you see enough to make any depth chart changes after last night? A: Right now, the depth chart is fluid. It changes each and every day. We’ll evaluate that more. We have a week of practice here, so we’ll get a good three days in, then we’ll start getting ready doing a mock-type week for Cleveland. But, nothing drastic yet. Q: Has QB Geno Smith moved ahead of QB Josh Johnson at the quarterback position? A: I think when you take a look at both quarterbacks, I think they both did some good things in the ball game, but there were definitely some inconsistencies. Q: Are you concerned about the depth behind T Ereck Flowers since T Chad Wheeler struggled a bit in the game last night? A: I want to see the young guy continue to play and continue to develop. Keep Chad in the mix. We need to keep pushing the starters there as well. Q: How did you come out from a health standpoint with S Duke Ihenacho? A: Duke felt his hamstring in the ball game and Calvin Munson fell on his knee, but it doesn’t seem to appear to be anything serious at this point. More of a contusion. Q: What did you think of defensive tackle Jay Bromley’s play in last night’s game? A: I think Jay’s improving. He’s playing with some hostility out there, he’s playing aggressive, playing physical football. 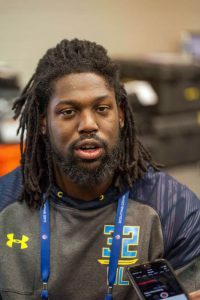 Q: Have Bromley and defensive tackle Dalvin Tomlinson separated themselves from the competition? A: It’s still early to say, but those two seem to have a leg up now, especially with Robert [Thomas] being out. Q: What did you think of linebacker B.J. Goodson and safety Darian Thompson; both had extended playing time. A: I thought that Darian was a little rusty, but it was good to see him knock that rust off as he played a little more in the game. We count on it as really another rookie year for him. But we count on him improving with reps. I think B.J. got off to a good start at the positon. He had a nice rush in there and he’s a physical player and we look forward to him continuing to develop and get better. Q: Are there any ‘bubble guys’ that stood out to you last night? A: I think that we got a good look at that second and third group. We weren’t as productive as we wanted to be there and we’ll leave it at that. Q: What did you think of the tight ends last night? I thought Rhett [Ellison] came out, he had a good start in a Giants uniform. Was pretty good at the point of attack and caught the ball well, which was nice to see. 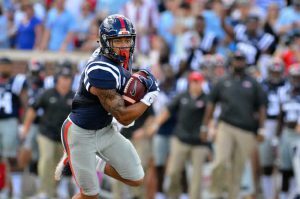 Evan [Engram] seemed to play with some speed down the middle of the field, but needs to be sharper in his assignments. Q: Anyone else other than Ellison and Engram that caught your eye among the tight ends? A: Yeah, Jerell [Adams] played with some good speed yesterday. [Will] Tye had some wiggle, did some good things on special teams, which will help him. [Matt] LaCosse got in there later on in the ball game, we need to get him to stay on his feet. He slipped down a few times. A couple guys did yesterday in the game and he needs to stay on his feet a little bit better, but he’ll have plenty of opportunities moving forward. Q: How do you think the reserve cornerbacks played in last night’s game, particularly Valentino Blake? A: I think Blake had a lot of snaps in the ball game, did some good things on special teams. It was nice to see him come up with the interception there. He needs to make sure he takes care of the ball better than he did. He was waving that thing around a little bit, but it was nice to see him make a play on the ball. They ran a nice double-move, he was isolated there for a touchdown towards the end of the game on the double-move. He was isolated and they made a nice play. Q: Did FB Shane Smith impress you in catching another pass, his block on the 4th down conversion and some good pass protection, too? A: Yes, I liked what Shane did on special teams. I think he has some fluidity to him for a fullback, for a big guy. That always helps because he’s going to have to be a special teams contributor if he has a chance. I think he can be sharper in his details from the fullback spot, and it’ll get better there over time in the next three weeks. 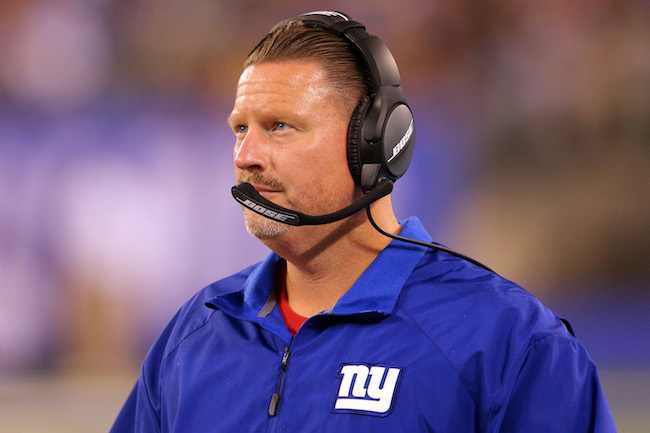 Q: Did you need to see your rookie kicker (Aldrick Rosas) make a 50-yard field goal just to feel better about him? A: You know what, it was exciting to see. I was champing at the bit even later in the ball game. We had the ball on the 35-yard line, but we were down by eight. I wanted to kick it there, but I also wanted to give the guys the chance to go down and score to tie the ballgame and give us a chance to tie the ballgame. It was exciting for him (Rosas) to get out there and see him make that kick. All the players around him were excited, too. Q: What went into the decision to alternate kicks between (Rosas and Mike Nugent)? Will that be the plan going forward? A: They’re in a competition. We want to keep things as even as we can. Q: What did you see from the running game? A: I saw some hits and some misses. We had some inconsistencies. We wanted to try and get some outside zone going in the ballgame just to work it, and it’s always tough to do that when you’re playing a 3-4 (defensive alignment) team. When they’re a two-gap mentality, it’s a challenge, but that’s what we decided to do, to put our guys to the test. We had some positives and some negatives to go with that, but we got a good evaluation on them. The downhill run game was better than the stretch game. We had some opportunities: first play of the ballgame, Paul Perkins was one-on-one with the safety, and we need more than seven yards there. He has to make him miss, and he has to run him over. We have to at least get a first down on that play. 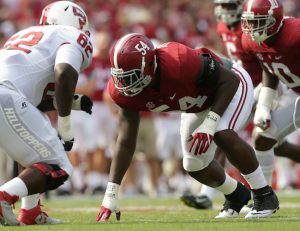 Q: Getting back to the defensive tackles, is Robert Thomas going to be back this week? And what is his injury? A: He’s going to start working back into the mix tomorrow. Q: Is there anyone else out of those injured guys, WR Tavarres King, LB Mark Herzlich, S Ryan Murphy, is there anyone else you expect back next week? A: We’re going to slowly start to integrate them back in the mix tomorrow. But again, there’s a lot of time. We have a treatment (period) that’s going to happen here shortly today, and one tomorrow morning. It’s still early. Q: Is that everybody that I mentioned there, is LB Keenan Robinson included in that category? A: He’s still in the protocol. Q: The other deep ball completed on CB Valentino Blake, was that S Nat Berhe not getting over in time, or do you put that on Valentino? A: Yeah, the post player slipped on the play. 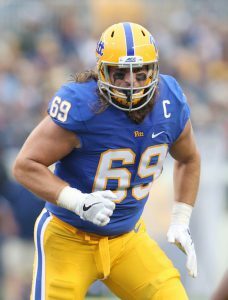 The New York Giants have waived rookie free agent linebacker Jimmy Herman (Purdue University), who the team officially signed on Friday when cornerback Mykkele Thompson was waived/injured. 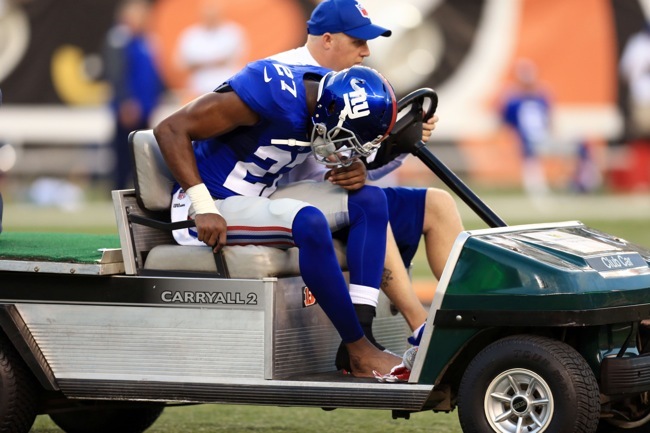 The New York Giants have waived/injured defensive back Mykkele Thompson, who had been battling a quad injury. To fill the vacant roster spot, the Giants signed rookie free agent linebacker Jimmy Herman (Purdue University). 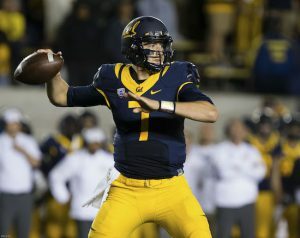 Thompson was drafted in the 5th round of the 2015 NFL Draft by the Giants. He missed all of his rookie season after rupturing the Achilles’ tendon in his right foot during the 2015 preseason and was placed on Injured Reserve in September 2016 after injuring his knee in Week 2. The Giants shifted him from safety to cornerback this offseason. Herman attended the New York Giants rookie mini-camp in May on a tryout basis, but was not signed. He has a nice combination of size and athleticism. 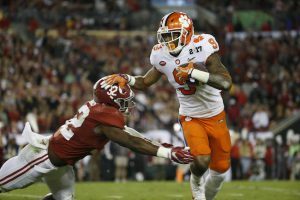 Herman played in eight games his senior season, and accrued only 28 tackles.